Powerful Earthquake Strikes Near Indonesia TODAY..!! Home » news » Powerful Earthquake Strikes Near Indonesia TODAY..!! A powerful and shallow earthquake of magnitude 7.9 has struck off the west coast of the Indonesian island of Sumatra, the US Geological Survey said. A tsunami warning has been issued for parts of Indonesia, including West Sumatra, North Sumatra and Aceh, and for Christmas Island and Cocos Island. The Australian bureau of meteorology also issued a watch alert for the country’s west coast. 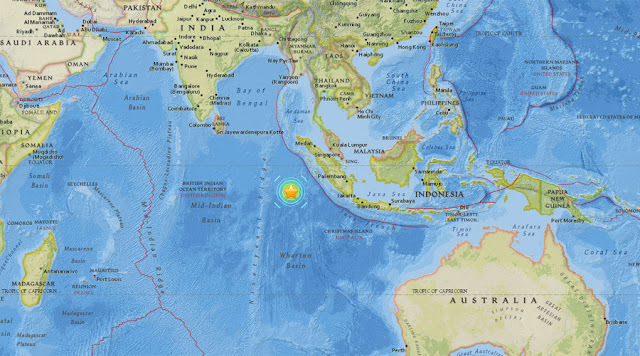 The epicentre was 502 miles (808km) south-west of Padang, USGS said. It was six miles (10km) deep. There were no immediate reports of damage or casualties but the shallower a quake, the more likely it is to cause damage. USGS originally put the magnitude at 8.2, and then 8.1, before lowering it to 7.9. Indonesia, badly hit by the Indian Ocean tsunami in 2004, straddles the so-called “Pacific Ring of Fire”, a highly seismically active zone where different plates on the earth’s crust meet and create a large number of earthquakes and volcanoes.